I am also warming my hands up for all of the other fun stuff leading up to thanksgiving day- like the fact that i finally got invited to a Friendsgiving!!! (Am I so tragic that I have never been invited to one before?!) Anyway, for my first friendsgiving I am bringing this salad along with a stuffed pumpkin (recipe coming soon) and this caramel apple crisp dessert. I also have Coco’s 8th birthday coming up (can you believe that!!??) so this salad may get a little air-time there as well! So I know escarole is a bit obscure as far as greens go, and truthfully I was searching for some nice lacy frisee at the store. But I came up short with the frisee and instead was charmed by the lightly curled tendrils of the bigger bolder escarole. ***If you can’t easily find escarole, just substitute romaine hearts. 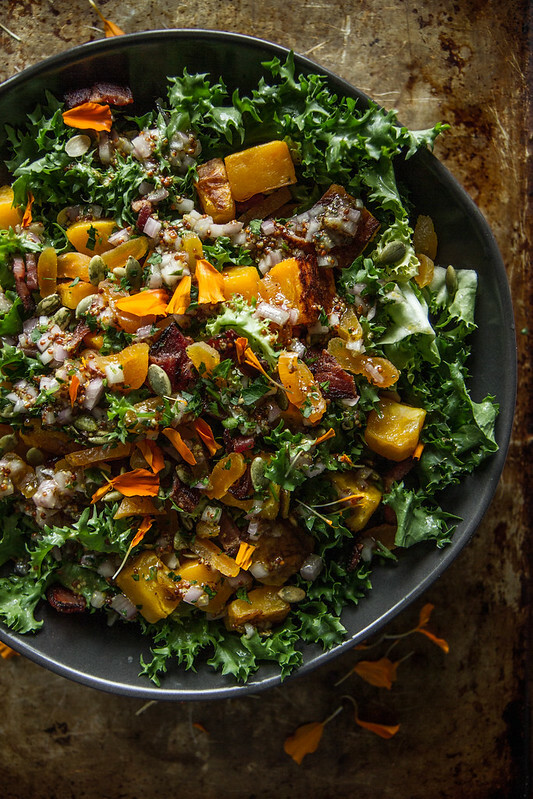 This is the best mix of salty, tart and sweet ever all rolled into a salad! It's rich autumnal flavors make it the perfect salad to accompany any dinner- this is a Thanksgiving table worthy salad for me! Preheat the oven to 375 degrees. Toss the squash with the olive oil and sprinkle it with kosher salt. Roast the squash for 15-18 minutes until golden browned on the edges and fork tender. Set aside to cool. In a small bowl whisk together the vinaigrette and season to taste with kosher salt. 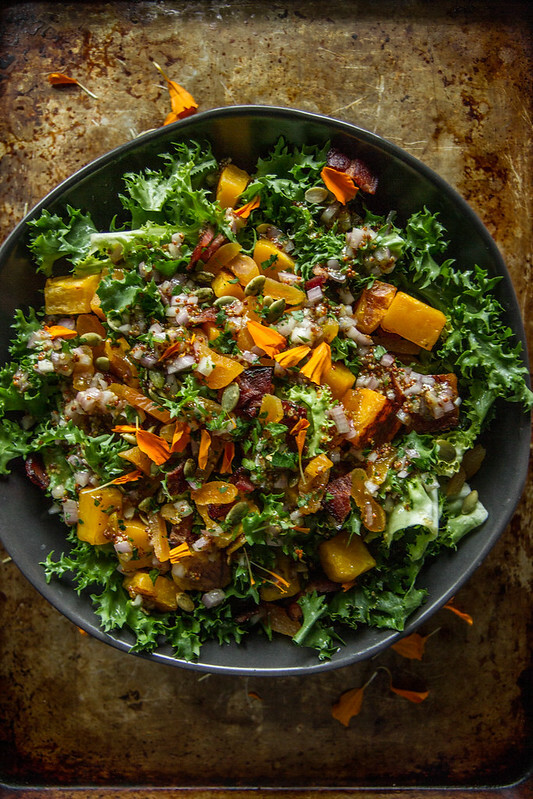 In a large bowl combine the escarole, bacon, apricots and pepitas with the butternut squash. Drizzle the vinaigrette over the top and gently toss to coat. Season to taste with kosher salt and serve immediately. I love the crunch of pepitas in a salad! 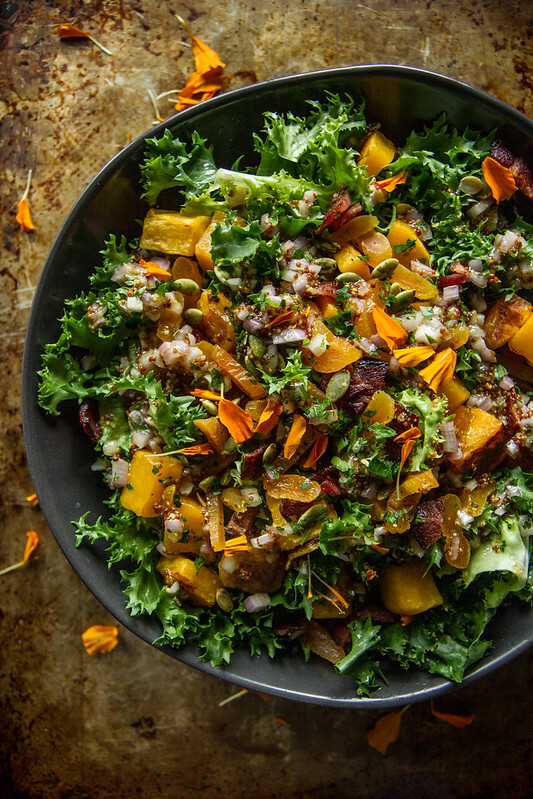 This is seriously one of the most gorgeous Fall salads I’ve seen!! I love how creative and beautiful you make salads! Have fun on your travels!! This salad looks fantastic! I made this tonight!!! (Sadly it was with green leaf lettuce and not escarole but…) YUM! You are the salad guru! I love ALL the ingredients in here! And that shallot dressing sounds great, too! veggies and bacon just belong together. YUM! You always make the best salads!!! This salad has it all!